1. A belief in clearly defined public policies and programs that are affordable, effective and accountable to the people. To me transparency in government is something that I stand for. Any politician must be accountable to the public. 2. The BC Conservative Party believe in managing with the highest standards of integrity and transparency. Again, an extension of the first principle, integrity in government must be absolute. When you enter politics, you must accept from day one that you will make choices that offend some. To be guided by an attempt to please everyone is ill-founded. As soon as pandering begins, integrity ends. How do I know anything about integrity? It started when I was very young and a family friend who was a politician influenced my parents. 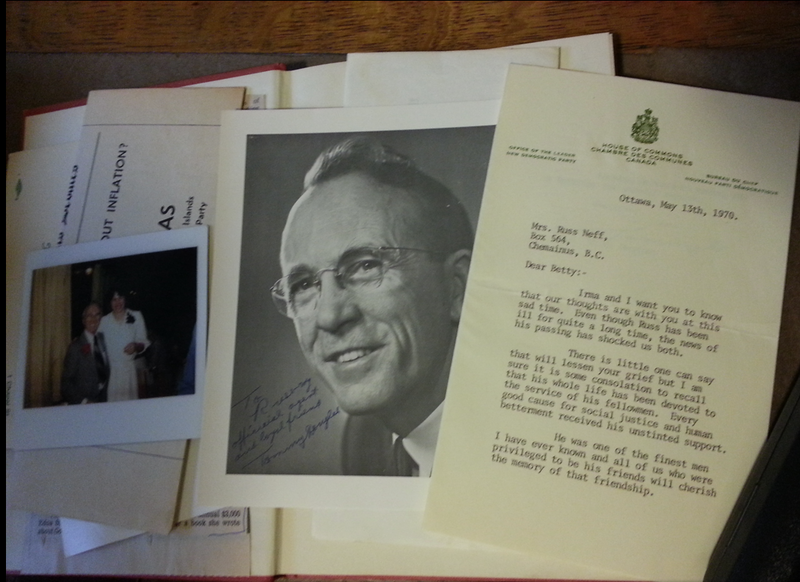 He influenced the lives of my great Uncle Olaf Turnbull, who himself was an MLA in Saskatchewan for the Canadian Commonwealth Federation or CCF. 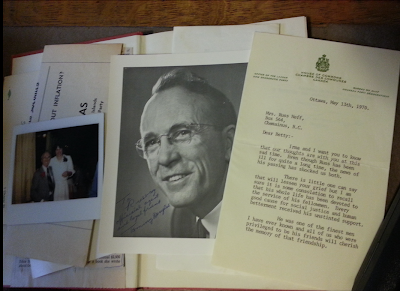 This family friend became the Saskatchewan CCF's leader and then the seventh Premier of Saskatchewan from 1944 to 1961. His government was the first democratic socialist government in North America, and it introduced the continent's first single payer, universal health care program. He did this with integrity and conviction. This was done before I was born but we heard stories of the man who had a dream, a vision and would not let public influence sway him from that dream. That man was named Tommy Douglas. He later was named The greatest Canadian by a CBC television program in 2004. Here he is with my mother around 1970 (left), a photo of himself he gave to my late grandfather and a letter on the right he wrote to my grandmother expressing his grief that Russ had passed. He also spoke very highly of my late grandfather, another man, like my father, of integrity beyond reproach. 6. A belief in restructuring the taxation system to maximize benefits for the greatest number of BC citizens. 7. A belief in a competitive free enterprise system as the basis for prosperity and growth. Protection and management of our environment and natural resources to optimize benefits now and into the future. This is indeed true. There is no rational argument to destroy the environment. We simply do not have to in order to prosper. Our logging, fishing and agricultural industries depend on a balanced approach to the environment.